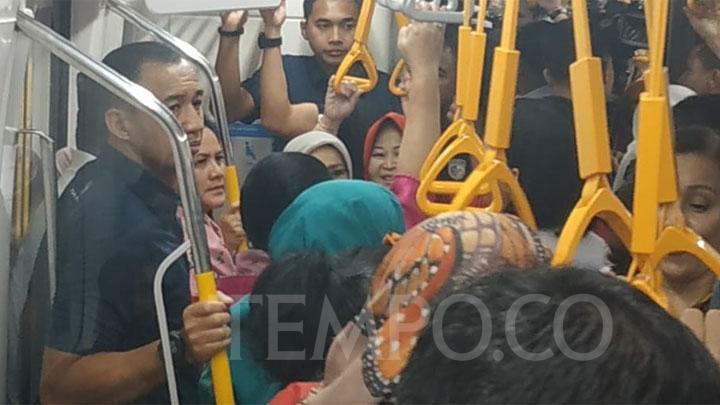 JAKARTA, Indonesia – Indonesian First Lady Iriana Joko Widodo together with VP Jusuf Kalla’s wife Mufidah Jusuf Kalla participated in the limited MRT trial run from the Bundaran HI station today on Monday. Iriana and Mufidah were joined in the current cabinet’s solidarity group OASE KK comprised of State Ministers’ wives. They opted to experience the MRT that is offering trial runs from March 12 to March 24 prior to its official launch at the end of this month. It was a unique scene with First Lady Iriana in a crammed MRT train, mixing it with other members of the public. The train was so packed that Iriana had to stand near the train’s door. Arriving at the Lebak Bulus station 30 minutes and 16 kilometers later, Iriana Jokowi and her group transferred to another train heading back to the Bundaran HI station. The MRT Jakarta train’s 16-kilometer track consists of a 10-kilometer overpass and six kilometers subway track.